When you listen to a sermon, do a Bible study or read the Bible during your quiet time with God, how many of the important things that God is saying to you do you actually remember? 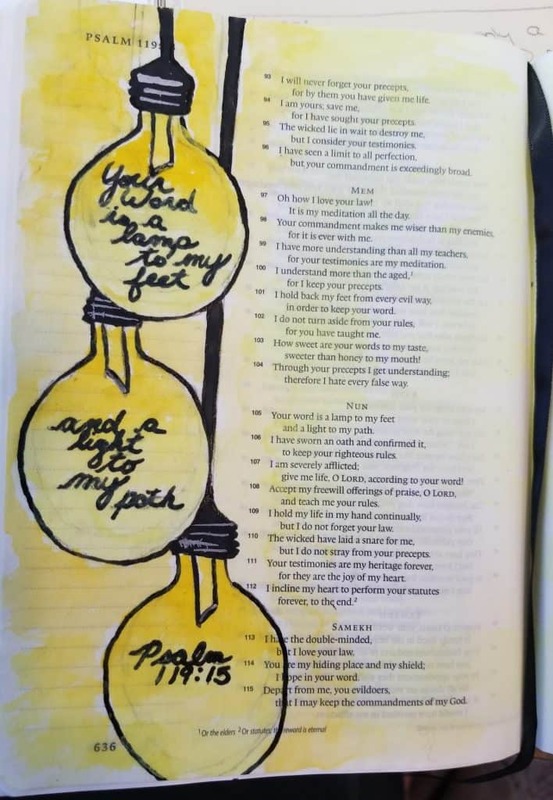 Bible journaling allows us to slow down and use our creativity as an expression of faith and worship. It is important not to compare your Bible journaling with others. 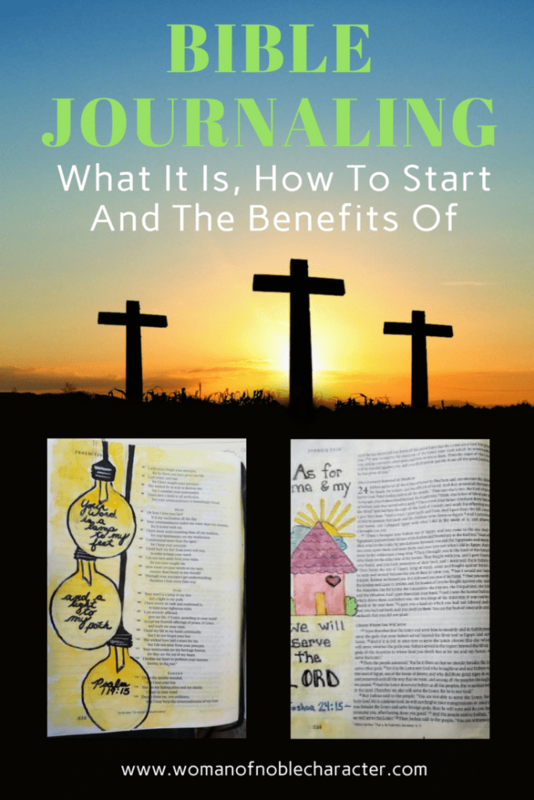 Bible journaling is YOUR creative and spiritual journey! Terrible at hand lettering (like I am)? Can barely draw stick figures? Don’t feel like you have a creative bone in your body? THAT’S OK! Simply write, draw and pray as God is leading you. This is about your relationship with Our Heavenly Creator, not an art contest. 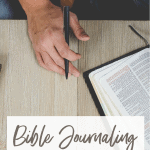 Bible journaling is simply the process of spending devotional time with God and recording the scriptural insights you receive from Him in your Bible. With a pen or highlighter in hand. Writing notes on what God is revealing to you on the pages of your Bible and highlighting verses that speak to you. With paint, markers or other art supplies to add doodles, drawings and other representations of your interpretation of His Word. Both provide an opportunity to faithfully hear, meditate upon, and apply God’s Word to our lives. 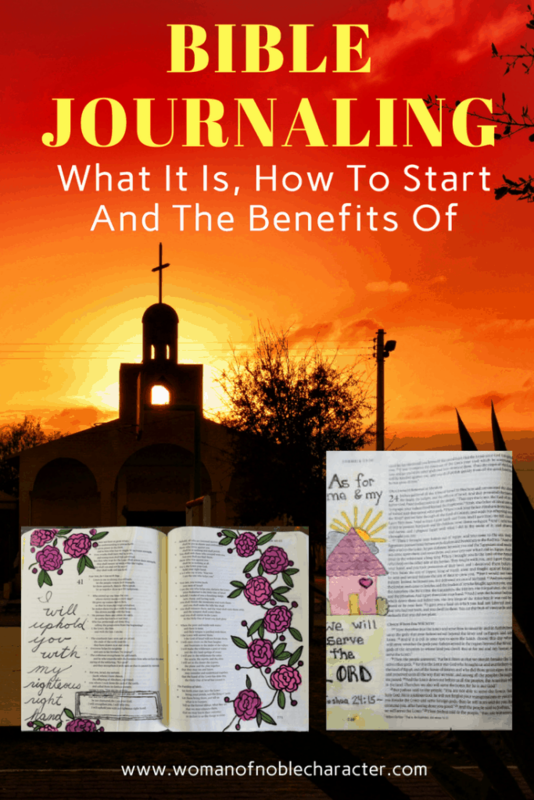 Even though the term is relatively new, the concept of Bible journaling is not. 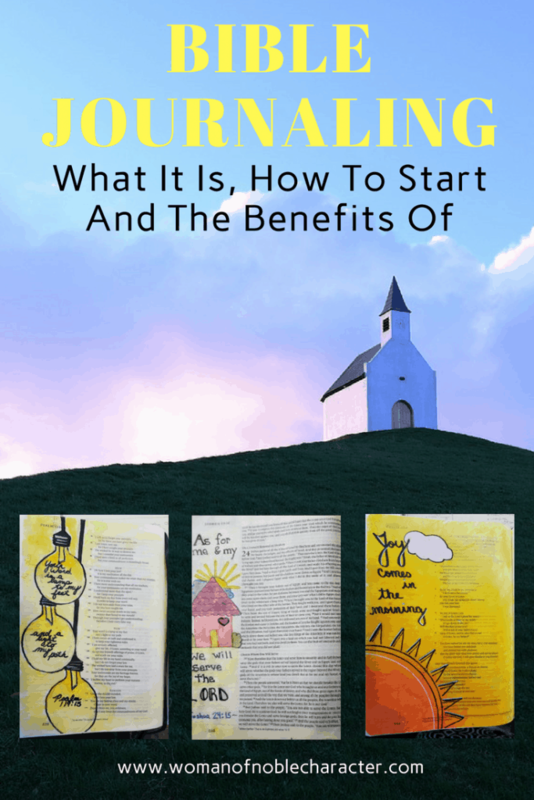 You can learn more about the history of Bible Journaling in this article on Scrapbook.com. 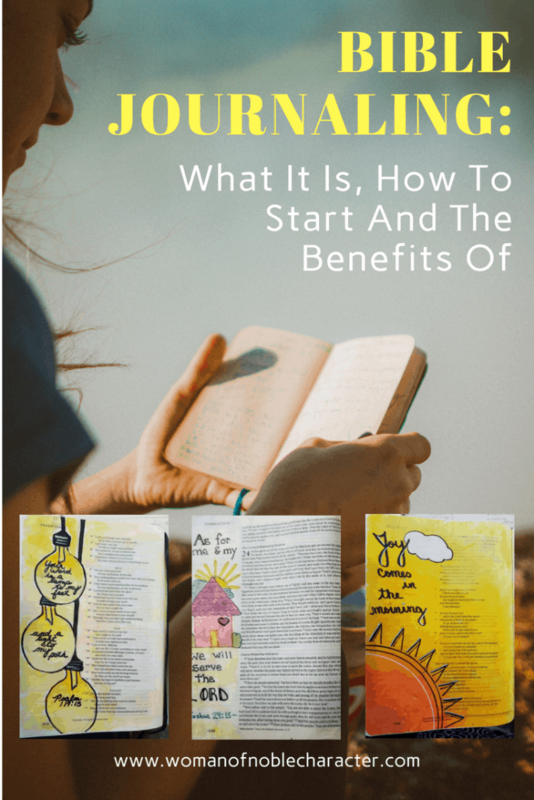 In a previous post, I shared the benefits of writing scripture and Bible journaling has many of the same benefits (and more!). 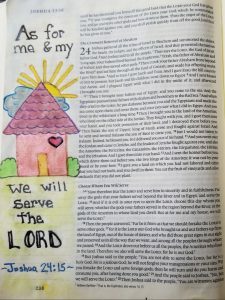 Bible journaling helps us to listen to what God is telling us and record that insight in a place close to our heart – our Bibles. 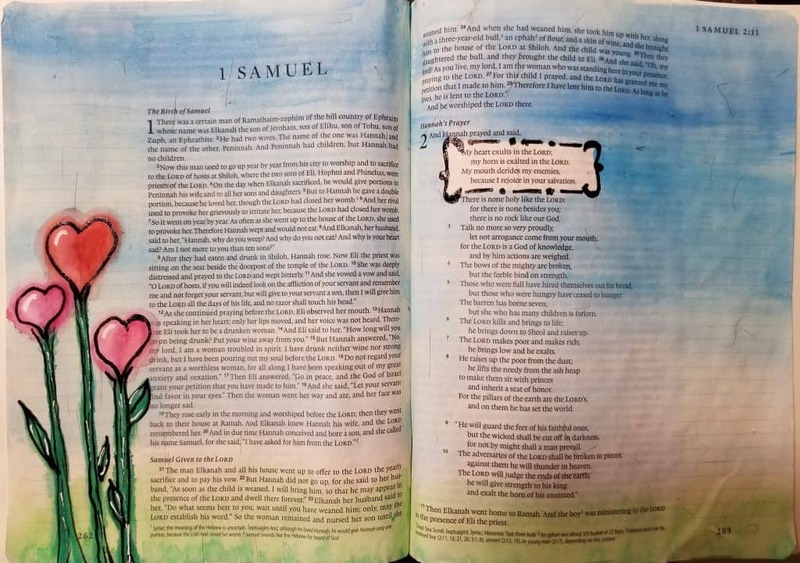 Bible journaling can be a solo activity – part of your quiet time with God, a generational activity – helping your children connect the Word of God creatively or a social activity – gathering with other Christian women for fellowship, inspiration and Bible study. 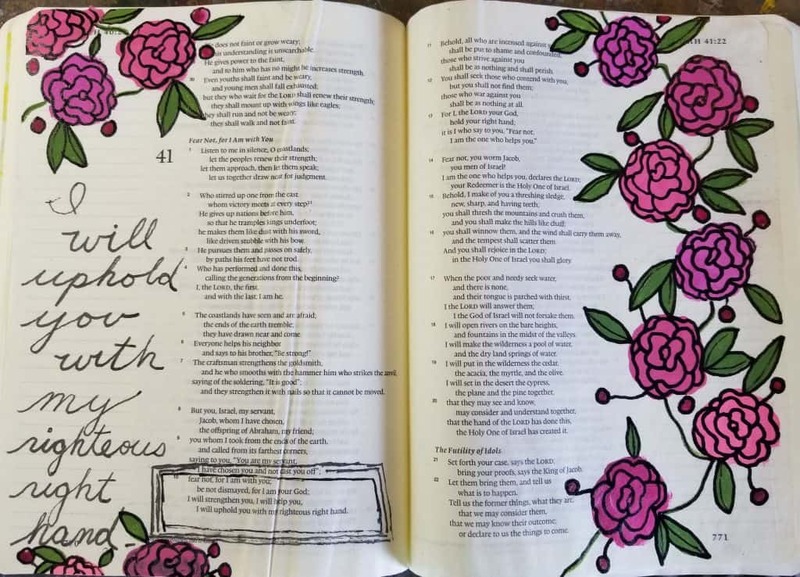 Most Bible journalers recommend that you start with a wide-margin Bible that gives you plenty of room to draw, write or decorate as you feel led. Choose a translation that you are comfortable with. I chose to use a different translation (ESV) from my “everyday” Bible (NIV) to allow me to compare translations. This is the Bible journaling Bible that I use. 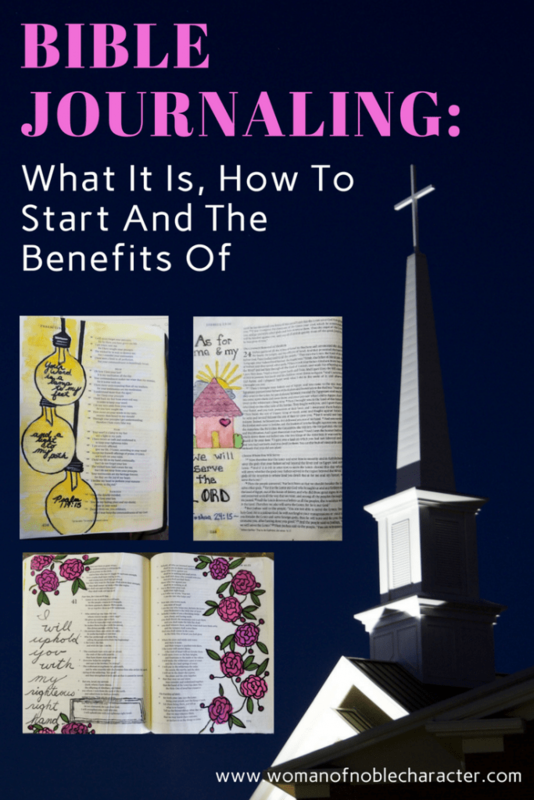 Bible journaling does not have to cost a lot of money. Start with what you have at home and add supplies as you go, IF you want and your budget allows. In addition to the obvious, your journaling Bible, I recommend a good set of pens or markers that won’t bleed through to the back of the page. My favorite pens and markers for Bible journaling are a Fude ball pen or the journaling pens by Stampin’ Up and a gel pen set. I also loooove double tipped markers (one side has a thin nib and the other a brush nib for lettering, like these. (If you are concerned whether or not a pen or marker will bleed, test them on a non-conspicuous page in your Bible – perhaps the concordance or other page in the back that you are less likely to journal on) . Other fun supplies to consider include alphabet stickers or, for a more economical choice, an alphabet stamp set (use over and over again!) or Christian decorative stickers, washi tape, stamps and ink pads, acrylic paint(I’m a big fan of Liquitex), watercolor paint or a Bible journaling pack from Illustrated Faith. TIP: If you plan on using any wet medium (paint, markers, etc.) I strongly encourage you to prep your page beforehand by “painting” 2-3 coats of clear gesso on your Bible page. As simply or as creatively as you like use highlighting and color-coding, written words, or other artistic techniques. Don’t get too hung up on the artistic side of things – your capacity to express yourself creatively will develop over time if that’s what you desire. Remember, the main purpose of Bible Journaling is to record what God is saying to you during your quiet time with Him. 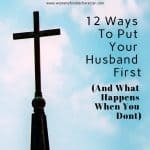 Hop onto Pinterest or here at Woman of Noble Character. Look for inspiration and try your hand at new supplies or techniques if you feel the creative itch. Some passages lend themselves to easier interpretation or ideas for images as they contain words for objects (such as heart, lamp, dove, arrow, bird, etc) Verses evoking feelings or abstract ideas might inspire you for doodling or an image of something that represents that idea. Our Journaling Bibles are living testaments to God’s greatness and His faithfulness in our lives. Let’s use them to minister as we minister to others, share our personal testimonies, and testify to God’s glory! 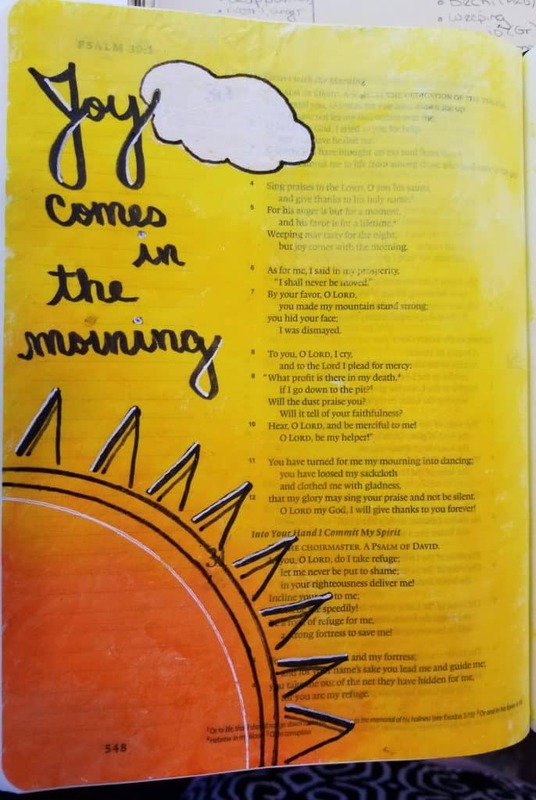 Do you currently use Bible journaling in your personal worship? If so, what do you enjoy most about it? If not, are you inspired to get started? Ready to dig into what the Bible says about our identity in Christ? Join us in Bible and Art Journaling Through the Bible: Our Identity in Christ six week course. Learn more!